The chapter starts with Lute and Navirou, they are flying with the Rathalos in direction to the Dovan Volcano, by hearing those words a hughe headache came towards Lute´s Palico. Finally Lute is able to see the village, a mining one, he looks on the distance that a Kid is being attacked by a Lodrome, so obviously Lute enters into action and saves the kiddo! Still, the moment he sets foot on the land a bunch of Hunters comes for him! They are ready with their weapons and to fight the Rider! They don´t trusth the people who use Monsters and are able to do a lot of savage things! It seemed that Lute was in big problem until a villager that sought the whole thing comes and saves him, he tells Lute that the Hunter and Villagers around the place are somewhat disgusted with the Riders since the past one sthat came here, a group of 3 Riders lead by one who has an insatiable bloodlust and its on a Monster killing rampage, passed by here. Lute understood that Cheval and the others passed here before him. Still, the Villager invites our heroes to his house so they can get a bath and eat… Some donuts. The Villager confess that he has a Son of Lute´s Age BTW. Meanwhile at Gildegaran, Simone is preparing everything to set forth to the adventure! Their objective is the mythical White Dragon, what Monster could be? That is still a mystery, Lilia then steps in and has a petition for her Captain… To let her go to Hakum Village, her hometown why? Because she wants to ask the Village Chief for any information he could have regarding the so called “White Dragon”. Pappa, Simone´s lieutenant says that Lilia should reconsider because they are about to leave and the Captain requested for her by name, so it is a big opportunity for her! Still, Lilia is set in discovering this White Dragon thing, and she truly feels that asking the Village Chief will be of help; Simone understands and let her go . Which of course lead them to Debli´s dubious store, he is selling those “Kinship Stones” at cheap prices! Lute and Navirou confronts him by saying that he is selling fakes! Piracy! Whitewash—I mean Yo ho ho! Debli defending himself says that he has gotten this Artificial Kinship ores! They might not be “Natural”; but works just as good as the one Lute has! Now anyone can be a Rider now! Navurou and Lute dares him to prove it and he grab one stone and does the “RIDE ON!” calling for his Poogie!... Ergo a Pig. The Poogie, technically they aren´t monsters; they are just piglets that the Hunters likes to have as pets and even dress them in cute outfits, if one is nice to them, legend says, that they will bring you good luck… and poo. In any case Debli tries to mount the Poogie; but fails every time! Contrary case is with Navirou who is able to ride the Poogie as if it was nothing. Navirou gets cocky and teases Debli by saying that he is a better rider than him and that Debli should become Navirou´s disciple! After goofing around, Lute says that it is time to go; but Navirou responds by saying that he will stay here and teach Debli, so Lute will go alone… That was weird; but whatever, Lute is going to the Volcano!...He is also taking the donuts. Back with Lilia, she has finally reached Hakum Village and is received by her Sister Loloa, Dan and Genie, after the welcome she goes to the Village chief for some answers regarding the White Dragon! …To be precise where Lute is. So the group has been reunited and now they are going the same way! An Aragaan the Mineral Monster! The Aragaan is a Brute Wyvern extremely heavy and powerful, it feeds with Rocks and has a very hard skin, at the same time it can take out sleepy or heat gas from its body, it attacks with it´s chin, tail or in the form of a ball (think like Sonic´s hooming attack). Still… This Uragaan has something funny, it has those mechanics things on his body; just like that Barroth of the other time. Suddenly the ones who did that reveal themselves… Manelger and Itsy-Bits! They reveal that after studying the Kinship Ore they have managed in making Artificial Kinship Stones (which Debli got some that were scattered). Now they can control Monsters! Lute is pissed at that because the Rider doesn´t control, they make a Kinship with the Mosnties! Lute calls for his Rathalos to attack; but the skin of the Uragaan is truly hard and Lute ends being captured by these 2 wackos! Later Manelger tells the imprisoned Lute to give it to him the Kinship Stone and he will set free, Lute rejects such thing. Soon enough Debli and Navirou appears and after seeing Lute being hostage his headache appears, the energy and electricity surround his body! Navirou has got electrified and attacks! After the attack Manelger and Itsy-Bits decides to dispose of them, not before remembering from where they meet Navirou. Ina ny case they activates a trap and make that Lute, Navirou and Debli fell on it! A very good chapter this week! 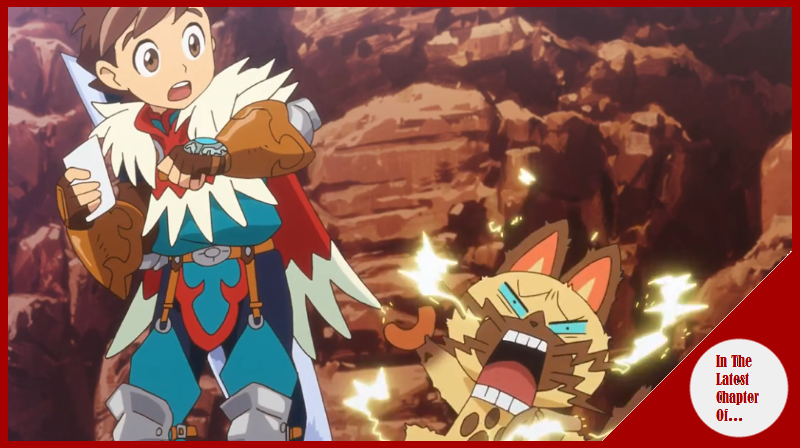 The pacing was very good and there was no boring moment in this chapter, also we got a Cliffhanger ending for what it is to come in the next chapter since it is time that we get to know Navirou´s past. Man I truly dislike Manelger and Itsi-bits! Those people are bad and truly damaging both people and Monsters! For it´s part, Cheval keeps on his rampage; but he also is doing a detriment to the overall mission since his actions in going for a killing spree are making the people feel insecure about how to feel with the Riders, heck if I were a Hunter I wouldn´t trust a blood thirsty fellow that has some Monster at his disposal either! Also we get to know a little more about Debli, and as any hunter, he has a Poogie although his one is truly big! Oh and yeah, I think the miner dude is Debli´s father…Just a hunch. Finally, yeah, The fact that the “Pikachu” of the series has electric power like the already known mouse-like Pocket Monster it is… Interesting; but hey! Navirou is cool too!